One of the most exciting wildlife-spotting excursions travelers can go on is a whale watching tour. Whale watching has been a popular tourism activity since 1950 when the Whale Overlook, the world's first public whale watching lookout, opened at the Cabrillo National Monument in San Diego, California. There are a number of public and private overlooks on the West Coast, from California to the Pacific Northwest and in Hawaii and Alaska, where travelers can spot whales during their yearly migrations. Overlooks are less common on the East Coast. "Federal law does not allow boaters to move within one hundred yards of whales (unless the animal moves closer on its own), but the rule is ignored by some boat captains. From the whale overlook it is not uncommon to see a whale being pursued by a dozen or more boats on a busy weekend, or to see whales take evasive action to avoid boats." According to NOAA, 10 different species of whale frequent the Arctic waters of Alaska. Of these 10, the most common whales seen on a whale-watching expedition are gray whales, humpback whales, and killer whales (orcas). The area of Southeast Alaska known as the Inside Passage is where many whale-watching expeditions head. Glacier Bay National Park, a 3.3 million acre park and one of the largest protected wilderness areas in the world, is part of the Inside Passage. Whale watchers also choose to cruise Southcentral Alaska, which includes the Kenai Fjords National Park and Prince William Sound. Alaska has resident killer whales and is the destination for migrating whales during the summer. The whale-watching season here runs from approximately May to September. May and September are typically less touristy and chillier. High season is June through August. Travel Alaska recommends spring whale watching, too. Here are a few tour companies that offer smaller, more eco-friendly whale-watching excursions. Wilderness Travel. Whale-watching and sea kayaking in the Inside Passage. Specializes in week-long cruise. Alaska Charters and Adventures. Offers small group, daytime whale-watching excursions of the Inside Passage. Sitka Wildlife Tours. Travelers can take a two-hour whale-watching tour among other offerings. Pacific whales travel from Mexico to the Arctic during their annual migration, making the coast of California an ideal place for whale watching. In fact, the world's first Whale Overlook opened at the Cabrillo National Monument in San Diego, California. Whale watching is possible along California's southern coast, central coast, and northern coast. In Southern California, from San Diego to Los Angeles, there are several locations known for superb whale-watching opportunities. They include San Diego, including the Cabrillo National Monument, and excursions departing from Dana Point, Newport Beach, Oceanside, and Long Beach. The Cabrillo Marine Aquarium, in LA, provides two-hour whale watching tours as part of its educational mission. On the Central Coast, Channel Islands National Park is considered one of the best whale watching spots in the world. Monterey Bay is also renowned for its whale watching. For Northern California whale watching, consider the Farallon Islands off the coast of San Francisco. They are often called the "Galapagos of California" because of their marine diversity. Humpback whales return to the warm waters of Hawaii each year to breed, calve, and raise their young. According to Hawaii Tourism, approximately two-thirds of the North Pacific's humpback whales migrate annually to Hawaii. Humpback Whales return to Hawaiian waters in the winter in spring. Travelers who want to go on whale watching excursions while visiting Hawaii should book between December and May. The Pacific Northwest is the domain of orcas (killer whales) though other whale species migrate along the northwest coast on their way to and from Alaska each year. The Whale Trail is a superb site for learning more about whale-watching overlooks throughout the Pacific Northwest. The site also has information on types of whales, migration news, and conservation efforts. Further, the Pacific Whale Watch Association is an organization of 33 businesses devoted to whale watching and ecotourism in the waters off the coast of Washington. By far the most fruitful place for a whale sighting in the Pacific Northwest is in the San Juan Islands, either from lookout points on land or by charter boat or kayak. The Whale Museum in Friday Harbor provides education and conservation support for whales in this part of the ocean. The Oregon Coast is less known for its whale watching but it is still possible here. Visit Oregon lists 26 whale spotting sites on the Oregon Coast, among them the Whale Watching Center in Depoe Bay and, nearby, a personal favorite (at least, in name)—Cape Foulweather. Year-round whale watching is possible along the Washington and Oregon coasts, with May/June considered peak viewing time as the whales make their way to Alaska. Whales still inhabit the North Atlantic but the coast of New England is not as known for whales as it was when whaling was a huge and profitable industry from New York to Maine. You can learn more about the history of whaling in New England at whaling museums in Cold Spring Harbor, New York; New Bedford, Massachusetts; and Nantucket, Massachusetts. Luckily, the whaling trade has long ceased. Today the North Atlantic is a breeding ground for Humpback, Finback, and Minke Whales. 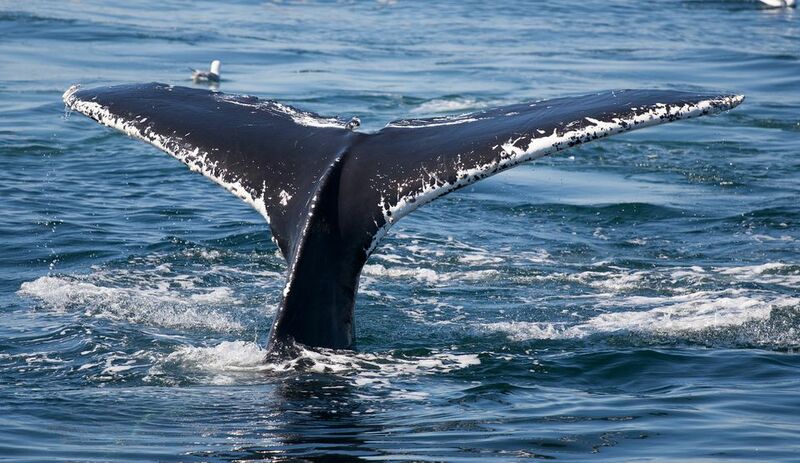 Maine, New Hampshire, and Rhode Island all offer opportunities for whale watching enthusiasts, but coastal Massachusetts, particularly around Cape Cod Bay, is considered some of the best whale watching spots anywhere. Discover New England has listings of whale-watching tour companies and links to museums where visitors can learn more about the old whaling traditions and the current whale conservation efforts. Summer is the best time to spot whales in the waters off of New England. The season lasts from May through October, with peak times coinciding with peak tourism season (July and August).